To get a plenary indulgence we have to be completely detached from sin, affection for sin, even venial sins. Since only Our Lord and Our Blessed Mother were perfectly free from attachment to sin, how can any of us ever gain a plenary indulgence? Doesn’t the Church set an impossibly high standard? Why bother trying? First, having high standards is a good thing. Shouldn’t we be free from attachment to sin? To what degree is being attached to sin okay? In the final analysis, perhaps we have to admit that gaining plenary indulgences is rarer than we would like. That said, it is not impossible. And I don’t think we have to be a hermit living on top of a tree beating his head with a rock to be free of attachment to sin so as to gain this plenary or “full” indulgence. Also, we do not know the degree to which a “partial” indulgence is “partial”. It could be a lot. That in itself is something which should spur us on! Generally, if someone is motivated to obtain an indulgence, he does so from true piety, desire to please God and to help oneself and others. When it comes to complete detachment from sin, even venial, few of us live in that state all the time. Nevertheless, there are times when we have been moved to sorrow for sin after examination of conscience, perhaps after an encounter with God as mystery in liturgical worship or in the presence of human suffering, that we come to a present horror and shame of sin that moves us to reject sin entirely. That doesn’t mean that we, in some Pelagian sense, have chosen to remain perfect from that point on or that by force of will we can chosen never to sin again. God is helping us with graces at that point, of course. But we do remain frail and weak. But God reads our hearts. Holy Church offers us many opportunities for indulgences. The presupposition is that Holy Church knows we can actually attain them. They can be partial (and we don’t know to what extent that is) and full or plenary. But they can be obtained by the faithful. Holy Church is a good mother. She wouldn’t dangle before our eyes something that is impossible for us to attain. That doesn’t mean that a full indulgence is an easy thing. It does mean that we can do it. In fact, beatifications and canonizations have been more common in the last few decades and in previous centuries. The Church is showing us that it is possible for ordinary people to live a life of heroic virtue. Perhaps you are not sure you can attain complete detachment from all sin, even venial. Before you perform the indulgenced work, ask God explicitly to take away any affection for sin you might be treasuring. Do this often and, over your lifetime, and you may find it easier and easier. Support your good project with good confessions and good communions. You need those graces. A person does not become expert in worldly pursuits overnight or without effort. It takes time and practice to develop skills and virtues. It takes time to develop habits of the spirit as well. We can do this. And when we fall short, we still have the joy of obtaining the partial indulgence and that’s not nothing. This entry was posted in "How To..." - Practical Notes, ASK FATHER Question Box, Our Catholic Identity and tagged indulgences. Bookmark the permalink. So the temporal punishment remitted by a partial indulgences is equal to the intrinsic satisfactory value of whatever the act itself was. Of course, that tells us nothing in the absolute sense (nor could any measure; years and days and quarantines of canonical penance included). Maybe the satisfactory value of just one rosary would remit most of a person’s temporal punishment (though it seems doubtful). Really, it depends, of course, on the zeal and purity of the intent in the act. One Hail Mary prayed with fervent devotion may indeed be worth more than we can imagine. Even though I am very far from perfect, I still pray in hope and faith that the plenary indulgences I ask for will be granted. In a sense, these prayers are not only an act of obedience to Mother Church, but an act of Faith. I pray, also, that the Merits of Christ on the Cross and the Merits of His Perfect Mother make up for my imperfections. We must try. Donation matching! Such a deal! Seriously, thanks for pointing this out. It’s very cheering about partial indulgences. Is it though? [Actually, yes.] The Church now “matches your grant” as it were, but to me that sounds like it is likely to be a LOT less than, say, the equivalent of 300 years of canonical penance preformed at a similar level of devotion. Still, it’s not like satisfaction from the infinite treasury of merits is going to be “wasted” if it isn’t used, so why not err on the side of giving more on the off-chance that a few rare souls ARE making use of it all? I don’t really know except that this way seemed more “elegant” than the canonical-penance-equivalent measure. Even though I am very far from perfect, I still pray in hope and faith that the plenary indulgences I ask for will be granted. Who says it isn’t granted? The problem is with the receiver. Quidquid in modo recipientis recipitur. It’s like cupping your hands and having a gallon of water poured on them. A gallon is poured but not received. I guess I have a really simplistic outlook: do the best I can today, strive to do better tomorrow, and leave the bookkeeping to God. The relief from even a minuscule partial indulgence is far greater than the effort to fulfill the requirements for a plenary indulgence. WILLFUL attachment. A subtle difference, but an important one I think, and one that is easier to achieve (by God’s grace). There are many venial sins that we commit out of the weakness of our characters that, in a calm moment and without immediate temptation before us, we repudiate and refuse. We have no willful attachment to the sin, but fall into it out of bad habit and weakness. “I’ve talked to several priests on this and they all give the same answer. Plenary indulgences are not intended to be difficult to win. Furthermore, an indulgence is NOT a sacrament, it is only a sacramental. One can accurately describe it as a completion of the sacrament of reconciliation, but that’s as close as you get. Now, since even the great and glorious sacrament of baptism doesn’t free us from concupiscence, it would be quite absurd to think that we have to be free of concupiscence to win a plenary indulgence. The Church can’t mean that we must be, since it is not possible to be free of concupiscence while in the body. Furthermore, the saints are holy precisely because they are much more aware of their own concupiscence than most others, and therefore they struggle with temptation even more than we do because they recognize their attachments more clearly. Scott, your post much pleases me. Certainly one cannot be constantly free from attachment to sin. Sometimes we are and are in position to gain plenary indulgences and sometimes we aren’t. That leads me to wonder about the possibility of a man who sometimes has willingly earned plenary indulgences for him or for Purgatory souls and who years later loses the faith and leads a bad life endangering his soul’s salvation. NB: The Apostolic Constitution says attachment to sin. It does not qualify it by the mention of the word “willful”. From Indulgentiarum doctrina, Normae, 7, 2. Requiritur insuper ut excludatur omnis affectus erga quodcumque peccatum etiam veniale. The Latin text speaks of an “exclusio omnis affectus erga peccatum” – an “exclusion of all liking or favorable disposition towards sin”. The “affectus” is rendered in English as “attachment” – and it does not do it justice. I could have an “attachment” to something I don’t want and can’t get rid of it, but I cannot entertain an “affectus” (a liking) for something I don’t want. Otherwise: if I am not willing to put aside something sinful because I like it (affectus), I can’t obtain a plenary indulgence. If I am willing to part with it, even though I am weak and in need of divine assistance, I am free of the “affectus” (a favorable disposition) towards sin. Having said this I must add that this is my personal conjecture. I am not qualified to interpret the Church’s teaching on indulgences. In fact, I seem to remember that there is some warning in the official “enchyridion indulgentiarum” about staying out of interpreting or explaining or translating it – something to that effect. I understand that Paul VI tightened up the indulgence requirements in 1967 from what they had always been up to that time – which was freedom from serious sin (having confessed one’s sins), but did not require the post-1967 requirement to be free from attachment from venial sins to obtain the indulgence. Possibly the only post-conciliar instance when a discipline was tightened up. Ironic! Our former FSSP chaplain gave a talk on this subject and was appalled by this limitation on the availability of a sacramental at a time when indulgences were needed more than ever. As I am not asking for the indulgence for myself, the water image doesn’t hold-no pun intended. This discussion has been extremely helpful to me, as I pray for the souls in purgatory as a private ministry daily, especially with the Prayer of St. Gertrude the Great. It is, of course, Christ’s Merits which allow us to pray for the indulgence. But, the discussion here has been very helpful for one who sees praying for these indulgences as our duty. Attachment to sin is not the same as “imperfections”, according to my old spiritual adviser, an EF priest. He clearly made the distinction between the imperfections most of us fight against with the unwillingness to give up sin or a certain sin. Skipping my rosary a day here and there will not interfere with my ability to pray for indulgences, but attachment to pride or seeking the approval of others would. We visited the cemetery twice yesterday to say prayers for our ancestors. In the car, there was an argument about directions, as we rarely visit this cemetery, as we have not lived in that city for a long time. I would hope the family squabble about directions did not interfere with the indulgences, although impatience and anxiety were present shortly before the prayers. Again, we must do our little bit with the grace which is given and hope that we, through the Merits of Our Lord and Redeemer, enact some good through indulgences. I also believe that those who try are blessed through the fortitude and perseverance in these things done in a day with a busy family. If you like it, you will LOVE the calendar of indulgences I’ve been promoting for the last decade, since I also designed that – it’s at http://www.bridegroompress.com: a 12-month wall calendar that explains every indulgence the Church offers, and highlights every specially indulgenced day during the year (there’s over 30 of them now). The post-conciliar rules were, indeed, tightened. It used to be possible to earn several plenary indulgences each day. Now it isn’t (unless you are in the hour of death, in which a second can be won, but only under that condition). The month of November has more plenaries than any other season (apart from Lent. Lent is enriched with a special plenary every day of the season via the stational church days for the churches of Rome, but, of course, you have to actually BE in Rome and in those churches on each correct stational day to win those plenaries). 1. Affectus is doubly applied: To the will and to the passions. It is possible for the will to want a certain passion not to be disordered, but that doesn’t mean the disorder no longer exists. 2. Attachment to sin refers to vices (i.e., disposition toward sinful acts), which are opposed to virtue. Not all vices are formed with the consent of the will. For example, the fomes of sin are consequences of Original Sin, and some vices might have existed since childhood. 3. Further, when referring to the virtues (or the opposing vices) of the passions, St Thomas speaks of Continence and Incontinence. The first is an unruly appetite that is controlled, the second not controlled. Even in the first case, it is a matter of attachment to sin. As I am not asking for the indulgence for myself, the water image doesn’t hold-no pun intended. Of course, it does. The receiver of the indulgence would be in Purgatory, and so would still have attachment to sin. Otherwise, any soul in Purgatory would be freed by one plenary indulgence or, for that matter, one mass. If the “attachment of sin” which we must be free of includes the “fomes of sin” which is the consequence of Original Sin, i.e., if the Church insists we must be free of concupiscence (see http://www.ccel.org/ccel/aquinas/summa.TP_Q15_A2.html) in order to win a plenary indulgence, then the Church insists we do that which cannot be done. Which, ultimately, means Martin Luther was correct and indulgences cannot be won. I find that exceedingly difficult to accept. Thus, the handbook – in order to be at peace with what the Church teaches in other areas – cannot possibly mean to tell us that we must be free of concupiscence to win a plenary indulgence. The “freedom from attachment to sin, even the most venial” must, in some way, refer to an act of the will which we are capable of performing, for if it doesn’t, then we cannot attain the end the Church sets before us. I am not disagreeing with you regarding the person who prays being in sanctifying grace. I also agree that God knows who is ready to receive the benefit of the prayers in Purgatory. But, there seems to be a lot of information from the saints on prayers for those who have been in Purgatory being released with a set of prayers, or even three Masses. According to St. Gertrude, we can free souls from Purgatory by one prayer, without any other conditions. I do believe we can free a soul, not necessarily the one we have in mind, with one Mass or one plenary indulgence. I believe it is up to God to answer our specific prayers about a soul, such as my grandma, or a person who died on Sunday. Let us not be discouraged from trying by emphasizing our own unworthiness to the point of lacking faith or conviction. As to getting rid of attachments to sin, is that not something we should be doing daily anyway? Now, since even the great and glorious sacrament of baptism doesn’t free us from concupiscence, it would be quite absurd to think that we have to be free of concupiscence to win a plenary indulgence. That argument contradicts your position. And you’ve touched on a very complex theological problem. The effects of Original Sin are two: the culpa (guilt) and the poena mortis (penalty of death). Concupiscence is a consequence of both, the first because the lack of the (sanctifying) grace of Original Innocence disorients the will away from God; the second because of the lack of the harmony between the soul and body (not only ontological but also the soul’s powers). Now Baptism takes care of the first but not the second (at least, not immediately–we still die). That is why concupiscence remains. And concupiscence, by which the soul’s powers are inordinately turned to mutable good, is attachment to sin. As Forrest Gump would say, that’s all I’m going to say about that. For a more in depth treatment, you will have to read my dissertation, the complete publication of which is not imminent. The Church can’t mean that we must be, since it is not possible to be free of concupiscence while in the body. And that demonstrates why almost everyone goes to Purgatory. If memory serves, St Theresa of Avila said that even St Peter Alcantara spent one hour there. Furthermore, the saints are holy precisely because they are much more aware of their own concupiscence than most others, and therefore they struggle with temptation even more than we do because they recognize their attachments more clearly. And the saints are holy because of their closeness to God (the word “holy” in Greek, Latin, and Hebrew means set apart). That’s why the more saintly someone is, the more the struggle is with spiritual temptations, not those of concupiscence. The key to your comment is the word “can”–as in, one can receive a plenary indulgence. I don’t deny the possibility, but I insist, as does the Enchiridion, that it is necessary that attachment to sin, even venial, be excluded. Requiritur insuper ut excludatur omnis affectus erga quodcumque peccatum etiam veniale. As St. Paul explains to the Romans, a disorder is common to all humanity. 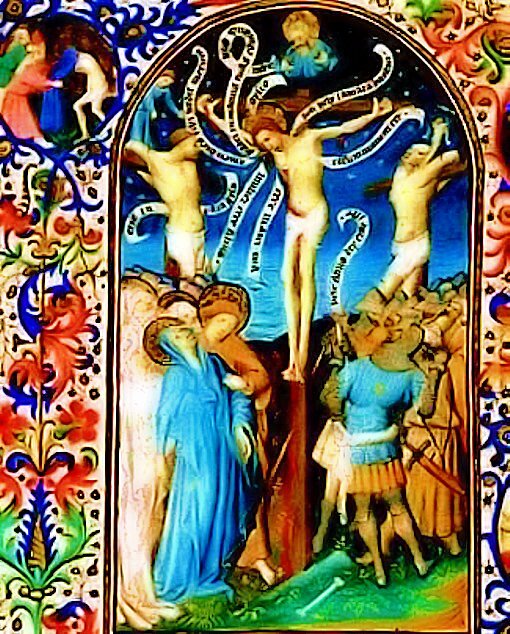 “Non enim quod volo facio bonum; sed quod nolo malum, id ago.” But the indulgence is not granted to some super-christians, free of all disorder. That which is lacking in an individual seeking the indulgence is drawn from the Church’s treasury. Same as above. The distinction made by the indulgence is not between vice and no-vice, but willed or not-willed vice. Looking at the human condition we see continence and incontinence. But divine grace is there to assist and heal. Once again I am thinking of the disposition of the person seeking the indulgence. The Church – seems to me – asks: do you want it? Yes. Are you willing to forgo – with divine help – all sinful pleasures? Yes. If you say yes to both, you are disposed to gain the plenary indulgence, and if you die, you go to heaven, like the good thief. I don’t know. Maybe I’m too optimistic. But at some point this cannot be too complicated. It isn’t called an “indulgence” for nothing. “Indulgere” is to forgive, to overlook, to remit. The sins were already forgiven in confession. Now the consequence of the evil acts is restored through a singular act of the indulgence. If I’m saying to myself: “hey. I think I’ll go back and do it again” then I’m fooling myself. But if I don’t, what keeps me from gaining the special grace? 1. We probably won’t be free of attachment to sin until 15 minutes after we are dead. 2. If there is someone who is, in this world, literally, free of the “attachment to sin,” they probably don’t need the help of an indulgence. 3. We sin because we are attached to it. We sin daily. Accordingly, the phrase, “attachment to sin” should not be taken literally. Rather, “attachment to sin” should be understood as a state in which one “makes a friend of sin,” “is deliberately familiar with sin,” “makes a home with sin,” “pursues and longs for sin” or asserts that a sin is a virtue rather than a vice. Understood in this way, it is possible, by God’s grace, for the average person to be free of the attahcment to sin and receive the generous benefits of God’s mercy. After all, the efficacy of the indulgence is not due to any merit of ours, but, rather, the union with the Righteousness of Christ.